Here at DataSpace HQ we have an exciting announcement to make. If you follow us on Twitter and Facebook between now and the 25th July you could be in with the chance of winning a Kindle Touch. With the holiday season here, and the British weather making everyone want to run to the sun, a Kindle Touch is the perfect addition to your suitcase. A Kindle means that you no longer have to pack your suitcase with 20 books just to keep you busy on your family holiday. 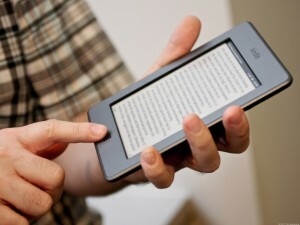 One slimline Kindle Touch is all you need. Our Facebook and Twitter pages are updated daily with the latest news from DataSpace, advice, tips and plenty of newsworthy content from around the world. When it comes to data we have it covered. From data management to archive solutions and confidential destruction. We regularly update our blog and share this amongst our social networks, so make sure you check back each week. By choosing to follow us on Twitter and Facebook you will be kept up to date. So, if you are running a business or working in an office that handles data then simply ‘Follow’ us on Twitter or hit the ‘Like’ button on Facebook. If you want to win a Kindle all you need to do is head to our Facebook page, and our Twitter page. You don’t have to be a client or a customer to take part in our great competition. All you need to do is to follow us and like us, simple. The draw will take place on Friday 25th July and we will draw the winner at random from both our Twitter and Facebook page. The winner will then be announced via our Facebook and Twitter page, so keep an eye out! For more information just give us a call.